Box junctions. These have criss-cross yellow lines painted on the road (see 'Road markings'). You MUST NOT enter the box until your exit road or lane is clear. 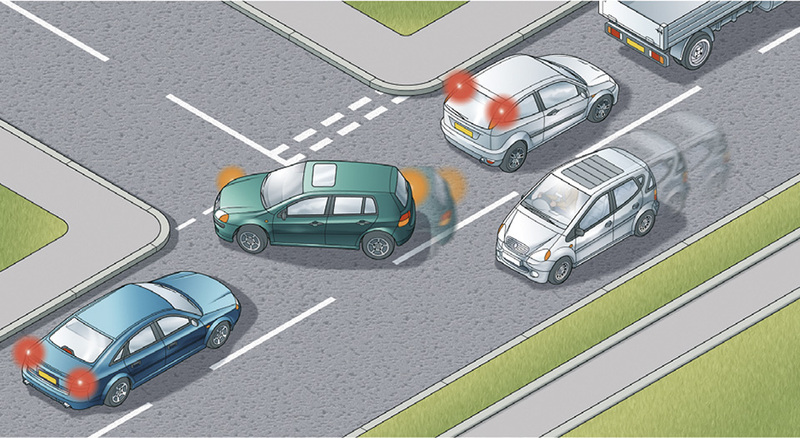 However, you may enter the box and wait when you want to turn right, and are only stopped from doing so by oncoming traffic, or by other vehicles waiting to turn right. 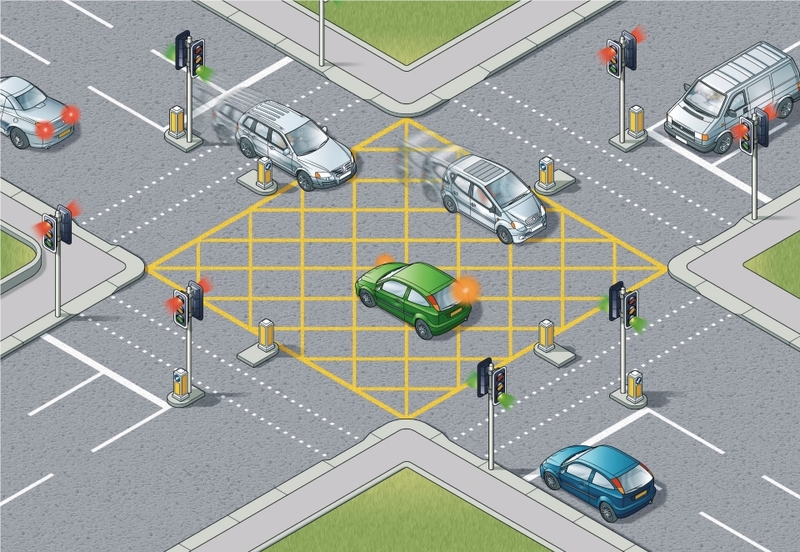 At signalled roundabouts you MUST NOT enter the box unless you can cross over it completely without stopping. Roadworks Charges For Utility Firms Will Cut Congestion - Councils . . . Councils are demanding new powers to charge utility companies a daily rate for digging up roads in a bid to reduce traffic disruption. The Local Government Association, which represents dozens of authorities across England and Wales, is calling on the Government to act to end the gridlock faced by millions of motorists. It wants councils to be able to introduce so-called lane rental schemes, where firms pay up to £2,000 per day for the work they do on the busiest roads at peak periods, without the need to get approval from the Transport Secretary. The LGA believes making it easier to charge utility companies would give an added incentive to finish work as quickly as possible. Revenue generated from the scheme would be invested in further work to reduce congestion. LGA transport spokesman Councillor Peter Box said there is a need for "robust and decisive action" and that councils are "being hamstrung by a lack of effective powers to tackle this issue". "Councils know their areas best and should be able to make decisions about traffic locally," he said. "This means they need the option of being able to introduce lane rental schemes without Secretary of State approval, which is time-consuming and bureaucratic." Only Transport for London and Kent County Council have been granted approval to run lane rental schemes. The LGA said the scheme in London has been a major success, significantly reducing levels of severe disruption caused by roadworks. Mr Box said: "While most utility companies are responsible and councils want to work with them, a minority do a poor job. "Expanding the lane rental scheme nationwide would incentivise utility companies to do the job right first time around and help get our traffic moving again." 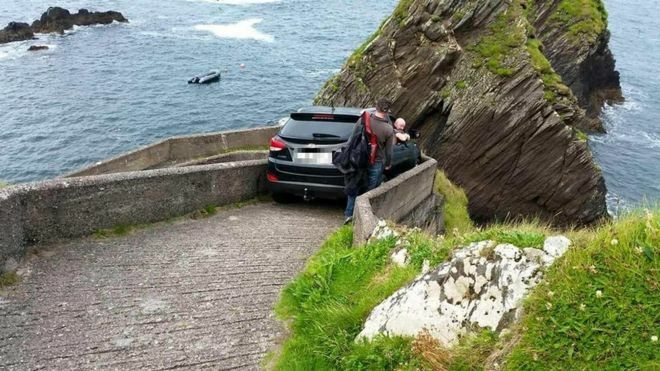 County Kerry: Driver 'stuck in car' after getting wedged in walkway . . .
A man has been removed from his car after it became wedged in a pedestrian-only walkway to a pier in the Republic of Ireland. The car got stuck at Dunquin in County Kerry. It is believed the man got stuck on Tuesday night and spent more than 12 hours in the car until a ferry crew came across him on Wednesday morning. He was helped from the car by Irish police before it was removed at about 12:00 BST. The pier is used for transporting people to and from the Blasket Islands, off the County Kerry coast. Sibéal Ní Lubhaing, of Blasket Island Ferries, said staff had "never seen anyone drive that far down" the narrow and windy path. "We were actually in awe of him, because there are couple of very sharp turns that you'd think a car could not navigate," she said. "There's also huge signs saying 'don't drive' going down to the pier." She said it appeared the man was in shock when staff found him early on Wednesday. "We're not sure, but it seems like he was there from about ten o'clock on Tuesday," she said. "After he got stuck, he didn't ring anyone for help although he had a mobile phone. "When the crews found him, he was reluctant to leave the car. I think the shock hit him and he wanted to stay in the vehicle. "But, when he saw the police uniforms, he seemed more reassured and we were able to get him out through the boot. "It was fairly innocent, everyone makes mistakes. Because it's our busy season there was a lot of people here this morning who saw what happened. "But, the main thing now is that he's safe. We're happy he's OK."
Irish police confirmed that they attended the scene and helped the motorist. Road haulage just keeps getting better, says RHA . . .
Road haulage is a key service industry for the UK economy, keeping businesses competitive and ensuring that shops have food and goods to sell. Every year, the industry keeps improving and 2015 was its best year ever, according to the Road Haulage Association. The latest statistics from the Department for Transport give clear evidence of the improvement. As the UK economy grew through 2015, lorries did much more work in response to increased demand from customers – but more productively. Goods moved – the DfT’s measure of road haulage activity – rose by 12% to 152 billion tonne kilometres – but the distance travelled by lorries increased by only 9%, to 18.4 billion kilometres. “This is a great performance by a big, diverse industry – and the reasons are dynamism and innovation,” says RHA director of policy Jack Semple. Innovation in equipment: for example more high capacity trailers – both double-decked; and longer trailers under the Department for Transport’s trial of trailers of up to 15.65 metres (compared with a standard maximum of 13.6 metres). Innovation in operation: with greater collaboration among hauliers through pallet networks and other collaborations, and persuading customers to allow greater vehicle sharing. Innovation in information technology: haulage is an IT-driven industry, not only for large firms but also smaller hauliers, allowing more efficient routeing and scheduling. “The road haulage and logistics industry is constantly innovating, although that is often overlooked. Large lorries are not only the most productive vehicles on our road but the latest Euro VI trucks are also ultra-low emission, quiet, and have the most advanced safety systems on the road,” Jack Semple continued. “All this has been achieved despite our roads being the busiest and most congested that they have ever been. The roads are the industry’s main place of work and we need to see the roads authorities matching the industry’s improvements, if the UK economy is going to flourish," he said. Uber's self-driving cars will pick up their first customers this month . . .
Uber's self-driving taxis will get their first real-world test in Pittsburgh this month, with the semi-autonomous vehicles assigned at random to customers using the company's app. 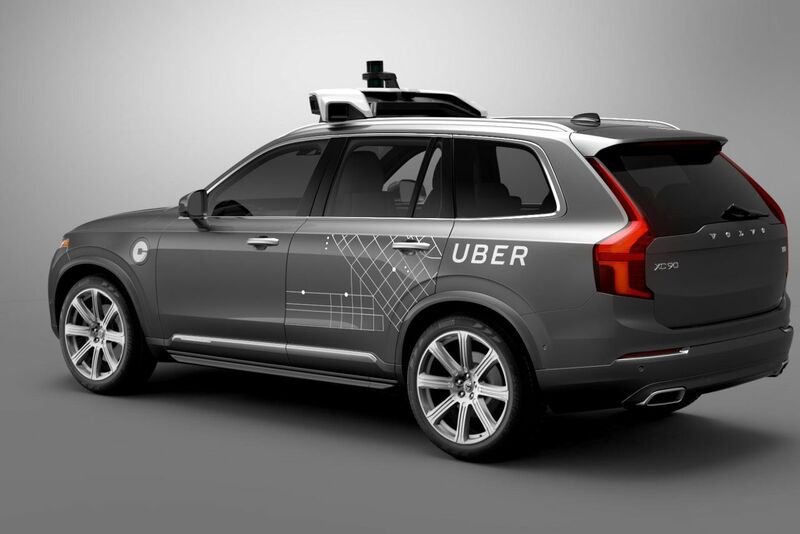 According to a report from Bloomberg, the test fleet will consist of modified Volvo XC90 SUVs, with each car supervised by a human in the driver's seat (a legal requirement) as well as a co-pilot taking notes. The trips themselves will be free, with a tablet in the backseat informing the passenger about the car's capabilities. Pittsburgh has been the home of Uber's self-driving ambitions since 2014, when the company began its quest to poach engineers from the robotics department of the city's Carnegie Mellon University. By early 2016, says Bloomberg, Uber had a team of hundreds of engineers, roboticists, and mechanics at its Advanced Technologies Center. Self-driving test vehicles were soon spotted around the city, and in May the company released its first official photo of a prototype vehicle — a modified Ford Fusion. The company has iterated quickly since then, and this month's deployment of semi-autonomous vehicles to actual (non-paying) customers is a significant step. Tesla's Autopilot software has been slowly increasing its functionality for drivers (despite a fatal crash in July that's currently being investigated by the NHTSA), and Google's self-driving fleet has been undergoing extensive testing, albeit with custom cars limited to speeds of 25 miles per hour. However, with this pilot program Uber is testing a rudimentary version of its final vision for self-driving cars: to replace its one million plus human drivers. As Bloomberg reports, full autonomy for Uber's vehicles is still a way off. For now, supervising engineers will sit with "their fingertips on the wheel," with chimes sounding when they need to take control of the car — like on bridges, for example. Volvo has so far delivered a "handful" of the self-driving test vehicles, with 100 due by the end of the year. The automaker also announced today that it has signed a $300 million agreement with Uber to develop a fully autonomous vehicle by 2021 — the same target set by Ford for its own self-driving car, announced earlier this week. The future, it seems, is coming on fast. RHA Messenger . . .
New proposals for lorry driver apprenticeships streamline and improve funding support from April 2017. The new structure should make LGV driver, and other apprenticeships, more attractive for smaller hauliers and follow strong lobbying of government. The RHA response is set out in a press release here. Member queries should be sent to deputy director of policy, Colin Snape, at c.snape@rha.uk.net. The RHA has passed information to NaVCIS, the police agency, on the theft of a trailer/container stolen late Monday night/early Tuesday this week from the secure yard of an RHA member at Eagle Industrial Estate, Bagnall Street, Great Bridge, West Midlands. The SDC skeletal had '51' on the front and “T.Baker & Sons” company logo. The brown shipping container (Serial No: TRLU 7317709) had a load of generators on board. Any Information? Contact West Midlands Police on 101 or NaVCIS or c.rampley@rha.uk.net. The most recent NaVCIS bulletin is available to members here. Lorry drivers are generally the best-trained and most professional on the road – but far too many are still ignoring the law on wearing seat belts. That was brought home to the RHA on a day with Essex Police last week. Around one in every five or six trucks was driven by a driver who didn’t have his seat belt on. In a relatively short period, a dozen drivers were issued with £100 fixed penalty notices and the same number escaped police censure. The RHA urges members to tighten up on compliance with this law, which is well accepted. Apart from mobile phones, the main message from Essex Police related to load securing. RHA head of technical services, Ray Engley, has been working with several police forces and with DVSA on loading issues. An example of what the police see is shown in Ray’s two pictures below, with a single frayed rope under winch tension holding two cars – just about. Wholesale diesel prices have risen by almost 5ppl in two weeks, continuing the volatility seen since the EU Referendum result on June 24. While the RHA's bulk fuel price survey last Friday recorded an average of 85.65ppl ex vat – this Friday is likely to see prices nearer to 89ppl, an increase of nearly 4%. Oil industry experts now forecast an increase of 24% in 2017 to around $56 a barrel. Queries to Nick Deal at n.deal@rha.uk.net. Members can view the RHA Weekly Fuel Survey here. The planned lorry holding area in Kent will have 500 overnight spaces with washing and toilet facilities for daily use, as well as another 3,600 spaces available when needed for Operation Stack. This is revealed in a new consultation document from Highways England. Drivers will be charged when Stack is not in operation but the HE is asking for views on how the service should operate. The chosen site is at Stanford West on the M20 close to junction 11. The RHA has been lobbying for more parking in Kent. We are discussing the plans with the HE and welcome member feedback. See the full consultation document here. The popular Marling Cross lorry park off the A2 at Grevesend has re-opened after five months’ closure. The RHA has welcomed the re-opening but says much more parking is needed in Kent. The construction sector slipped into recession with two consecutive three-month periods of decline since the start of 2016, official figures show. June was down 2.2% against the same month last year. Output fell in both building and maintenance. Further reductions are forecast following the Brexit vote. 'Warehousing and support for transport' depends on foreign people for 23.5% of its workforce, with 12% coming from Eastern European EU members and 9% coming from outside the EU, says a new report from the Resolution Foundation. The report urges investment in technology to reduce reliance on foreign workers but recognises that options for that are limited in some sectors. Ford to ship self-driving cars without steering wheels, brake or gas pedals by 2021 . . .
Ford says it’s going to deliver self-driving cars by 2021 – and these will ship in volume, and will also lack steering wheels, brake or gas pedals, offering full Level 4 self-driving features which don’t require a human driver at all, the company announced at a press conference in Palo Alto today. The car maker says that it has held off making any announcements about when to deliver self-driving vehicles until now because it isn’t in a race to make announcements. But it did say it is making self-driving vehicle deployment a priority, because of the advantages it offers in terms of customer experience and passenger safety. “We’re no longer just an auto company, we’re also a mobility company,” said Ford CEO Mark Fields at the press conference. He made that declaration after discussing Ford Mobility Solutions, which is a subsidiary Ford began to help it develop automated fleet driving services. Ford also announced it was going to ramp up its Silicon Valley operations, doubling its employee population in the tech center to over 300, with expanded offices and labs in Palo Alto. While self-driving cars are planned for mass production by 2021, Ford doesn’t see these replacing personal transportation in five years’ time. Instead, the company anticipates these being used mostly in urban environments as supplements to mass transit, while individual car ownership will continue to focus on vehicles with driver assist functions, but which ultimately still give humans control. RHA hails new proposals for lorry driver funding support . . .
An improved funding package for apprentices in the transport sector has been proposed that will open up even more opportunities for smaller firms. From April 2017, lorry driving apprentices will attract government support of up to £4,500, with an additional £2,000 depending on the age of the individual. Importantly, the funding obligation on smaller firms taking on 16-18 year olds has been reduced to nil. This transforms the whole recruitment and training landscape of the road haulage and logistics industry, for those who are willing to invest in the drivers of the future. Alongside the proposed package for new lorry drivers is increased support for traffic office and warehouse operative apprenticeships. There is also assistance available for apprenticeships where the individual needs support with maths or English of £471 for each of the two subjects. Levy payers make no additional co-investment. Thousands driving legally despite totting up more than 12 penalty points . . .
Thousands of motorists are driving on Britain's roads despite having racked up enough penalty points to qualify for a driving ban, according to new figures. Some 8,600 drivers have 12 or more points on their licence but are still legally allowed on the roads, a Freedom of Information request found. Two motorists, in Liverpool and Basildon, have clocked up 51 points each but are still driving, the research by esure car insurance revealed. Road safety charity Brake blasted the figures and called on the Government to "get tough" with "selfish, irresponsible and potentially deadly drivers". The figures mark a 25% increase from last year, when 6,887 drivers had 12 or more points on their licence, the Driver and Vehicle Licensing Agency (DVLA) data shows. Drivers with 12 points must attend court and usually face a six-month ban, but magistrates can use their discretion if the offender can show that losing their licence will cause them "exceptional hardship". 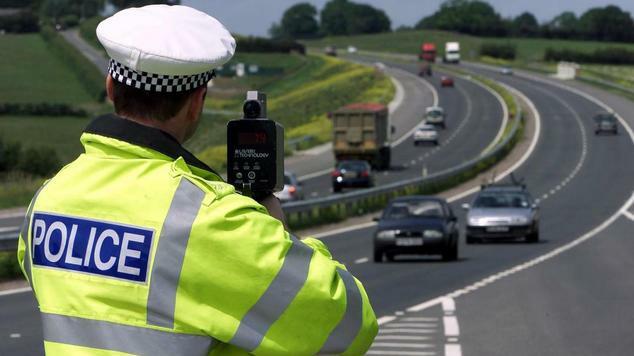 More than half of the 2.8 million people who currently have points on their licence were caught speeding, the figures covering England, Scotland and Wales showed. Other reasons for the points include careless driving, driving without insurance and failing to stop at an accident. Birmingham is the area with the highest number of drivers who have points on their licence, followed by Nottingham and Sheffield. As for drivers still on the roads despite having 12 or more points, Croydon tops the list, followed by Cardiff and then Leicester. In separate research carried out for the company by Opinium, more than 1.5 million people admitted taking points for others, with many saying they wanted to protect a driver who feared losing their job. Jon Wilshire, chief underwriting officer at esure, said it was "astonishing" that drivers could have so many points and not be disqualified. He said: "If drivers continue to flout the law then there need to be clear consequences. Driving safely not only guards you against getting points on your licence but also keeps drivers, passengers and other road users safe." A spokeswoman for Brake said the points system was never intended to allow so many people to "evade disqualification". She added: "It is outrageous that these individuals, who rack up offence after offence and show complete disregard for the lives of other road users, are allowed to continue driving. "It's time for magistrates and the Government to get tough with these selfish, irresponsible and potentially deadly drivers, and put a stop to their illegal and dangerous driving before it results in a devastating crash." Sheena Jowett, deputy chairman of the Magistrates' Association, which represents magistrates in England and Wales, said: "Magistrates deal with the vast majority of driving cases and, just like other offences, no two cases are ever the same. "Our members deal with cases purely on the facts before them and use discretion as the law provides, this includes issues of exceptional hardship. "It is for law-makers in parliament to decide whether the law surrounding driving bans and the points system needs to change." TC seeks to remind hauliers of Statutory Document No 1 – Good Repute and Fitness . . . The Road Haulage Association has been contacted by senior traffic commissioner, Beverley Bell, with the request that members should be reminded that if they are issued with an improvement notice by an enforcement agency, the agency in question must be notified that the improvements have been implemented. By way of clarification, Mrs Bell has made an amendment to paragraph 51 of Statutory Document No.1 (repute) to make this requirement clearer. Other conduct, such as a failure to heed instructions from enforcement agencies or police officers, attempts to circumvent the licensing system, recurring civil penalties, enforcement notices and breaches of other enforcement regimes such as the Home Office code of practice on preventing clandestine entrants, will also have a serious impact on repute. In such circumstances a traffic commissioner might be prompted to attach further conditions at grant or to seek undertakings to ensure compliance with those codes. How HGV drivers can help save the lives of traffic accident victims . . .
Every day, victims of road traffic accidents die needlessly because individuals immediately at the scene don’t know the basics of first aid. Many deaths occur from little more than a blocked airway, a condition that, with the right training, is relatively easy to treat. Death from a blocked airway occurs in about 4 minutes – the target time for an ambulance is 8 minutes. Driver First Assist (DFA) is an exciting, much-needed life-saving road safety initiative that is supported nationally by all three emergency services and the Road Haulage Association is pleased to be able to play its part by supporting DFAs aim to ensure that 30,000 drivers get the basic medical training they need to become DFA members. Training that will be provided by recently retired emergency response staff. Commenting, DFA founder David Higginbottom said: “HGV drivers represent a huge, immediate-response resource. They are often first at the scene of an accident yet few are trained in first aid skills. Skills that can mean the difference between life or death. “The medical knowledge of the first person to arrive at the scene is critically important. Over half of those seriously injured in a RTA lose their life before the emergency services even arrive. “It's easy to see why proper emergency training really can make the difference between life or death for the victim. 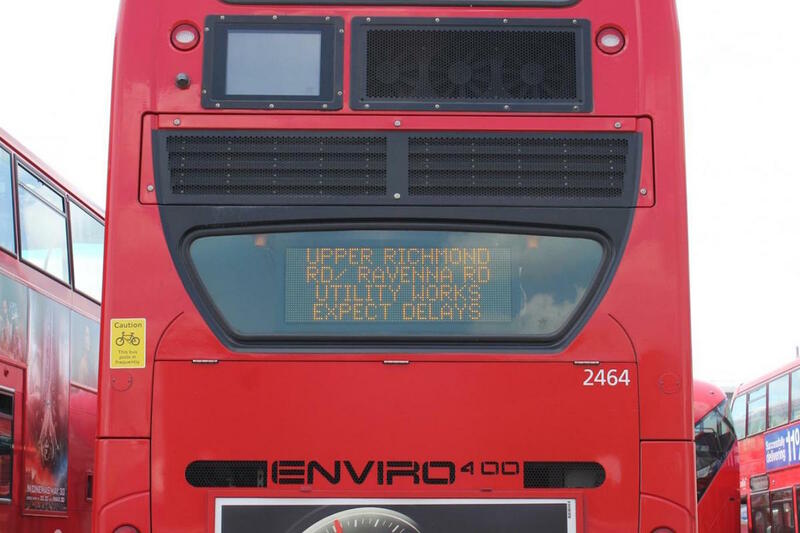 London buses to show live traffic updates in rear windows . . . The trial will run between Clapham Junction and Liverpool Street before expanding in the autumn. Over time, transport authorities have improved how they share important road travel news. Roadside signs can give a driver an important heads-up during journeys and apps can notify travellers before they've even left the house. As part of a new trial, Transport for London (TfL) wants to reduce the temptation for motorists to look at their phones while on the move by displaying live traffic information on the back of London's buses. The GPS-equipped digital information boards have been placed on a number of buses on route 344, which run between Clapham Junction and Liverpool Street. TfL says it's the first in the world to do such a thing and believes it'll help reduce congestion and improve the "reliability and efficiency of the roads." The six-month trial comes just weeks after TfL ended a similar test that puttraffic information on taxi-top signage of London's black cabs. The travel authority says that while double-decker tests are currently limited to one route, there are plans to extend it number 415 buses operating between Tulse Hill and Liverpool Street from the autumn. If they prove successful, the pilot could then be expanded across London. Highway Code: Slow-moving traffic . . .
RHA welcomes Transport Focus recognition for improved HGV driver facilities . . . The Road Haulage Association welcomes the report from the independent transport user watchdog Transport Focus about roadside facilities on England’s motorways and major ‘A’ roads which says that lorry drivers have said their needs are not being fully met by current roadside facilities. Commenting, RHA chief executive Richard Burnett said: “The UK haulage industry is the lifeblood of the UK economy and it’s the responsibility of HGV drivers to keep it moving. We have been working closely with Transport Focus from the start to ensure that the views of hauliers and their drivers were fully considered in the research and we welcome the report’s acknowledgement that the importance of driver facilities must be addressed and acted upon. The RHA is asking for a clear ministerial acknowledgement that the provision of adequate parking on its network is a core responsibility, both for the Department for Transport and Highways England. These provisions should be on a par with the quality of the road surface. The provision of facilities, including toilet and showers for drivers. “Drivers have a common-sense obligation to take breaks and, in the case of lorry drivers, there is a regulatory requirement to do so,” Richard Burnett continued. “We are already taking the message of responsibility the Department for Transport and Highways England. We have already flagged these issues with new secretary of state for transport Chris Grayling and roads minister John Hayes. We fully support John Hayes' vision for improving the design of roads and facilities – but that must include facilities for lorry drivers. The issue of lorry parking has been highlighted with plans for a holding area in Kent for Operation Stack. That is important for emergency use but Transport Focus has highlighted the need for a better approach to where lorries park as they go about their essential work for the UK economy. Driving test consultation: interview with Lesley Young . . .
Lesley Young, Chief Driving Examiner, answered your questions about improving the car driving test on Friday 12 August 2016. Highway Code: Driving licences . . .
You MUST have a valid driving licence for the category of motor vehicle you are driving. You MUST inform the Driver and Vehicle Licensing Agency (DVLA) if you change your name and/or address. Highway Code: Mobile phones and in-vehicle technology . . .
Highway Code: Road works . . . When the 'Road Works Ahead' sign is displayed, you will need to be more watchful and look for additional signs providing more specific instructions. Observe all signs - they are there for your safety and the safety of road workers. ‘Graham’ shows how an evolved human body could survive a car accident . . .
Human bodies aren’t evolving quickly enough to withstand the force of a major car accident using today’s auto technology. To help illustrate this, Australia’s Transport Accident Commission has built Graham — a lifelike, interactive model made to show the bodily features that humans might be equipped with if we evolve to endure blunt force in crashes. Essentially, Graham is the only one out here that can survive a major collision on the road. Unless you can evolve to his level. The auto safety project concentrates on Graham’s eight crucial body zones, including the brain, skull, face, neck, rib cage, skin, knees, and legs/feet. The study then goes zone-by-zone, describing how each body part would need to evolve to withstand such force during a crash. For example, the TAC made Graham’s skull bigger, filling it with more cerebrospinal fluid and ligaments to prepare the brain for when a collision occurs, offering him greater safety. Graham’s rib-cage protection was bolstered with a barrel-like chest with sacks between each of his ribs that would act like airbags during a crash. And TAC gave Graham hoof-like legs with added joints that would allow him to spring up and out of the way during a crash to avoid enduring major force. Hoof-like legs to minimize leg and foot injuries during an accident? Probably not evolutionary traits in our near futures. But that’s the point that TAC is trying to drive home — rather than leaving solutions to evolution, improved roads could help in the meantime. “Cars have evolved a lot faster than humans and Graham helps us understand why we need to improve every aspect of our roads system to protect ourselves from our own mistakes,” TAC chief executive officer Joe Calafiore said in the organization’s press release. TAC worked with an auto accident expert, trauma surgeon, and Melbourne artist to bring Graham to his lifelike state. New measures to help Britain lead the way in developing driverless technology . . .
Have your say on the use of advanced driver assistance systems and ‘self-driving’ technologies in cars on British roads. A major consultation to help pave the way for automated cars to be used on British roads is being launched, with all drivers invited to have their say. Under the proposed measures, rules will be changed so automated vehiclescan be insured for use on the roads. In addition, the Highway code and regulations are to be altered so advanced driver assistance systems that change lanes on the motorway and park the vehicle by remote control can be used safely. Separately, the government will next month launch a competition for a further £30 million from the Intelligent Mobility Fund, for research and development of innovative connected and autonomous vehicle technologies. This builds on the first £20 million awarded to a number of projects in February, and ensures the UK is able to take advantage of the latest technological developments in driverless cars research. An additional £19 million fund is also paving the way for driverless car projects in Greenwich, Bristol, and a joint project in Milton Keynes and Coventry. The government is determined that Britain leads the way globally in embracing the safe development of driverless technology. 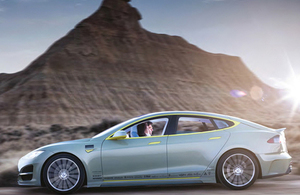 "Driverless car technology will revolutionise the way we travel and deliver better journeys. Britain is leading the way but I want everyone to have the chance to have a say on how we embrace and use these technologies. Our roads are already some of the safest in the world and increasing advanced driver assist and driverless technologies have the potential to help cut the number of accidents further." "Britain’s auto industry has always been at the forefront of innovation and research. This additional £30 million of funding for reseach and development (R&D) is a further sign of our commitment to making sure we’re creating opportunities for UK businesses to thrive and attract global investment in world-class technology." Cars with advanced driver assistance features, like remote control parking and motorway assist, are expected to be on sale in Britain in the next 2 to 4 years with automated and driverless vehicles expected on the roads any time from the mid-2020s onwards. Advanced driver assistance systems and ‘self-driving’ technologies will transform travel helping deliver safer, smoother and smarter road journeys. The consultation on the 2 changes is due to get underway today (11 July 2016) and will last for 9 weeks. It is the start of a rolling programme of reform on the roadmap to fully automated vehicles. The proposed changes to insurance will be brought forward in the Modern Transport Bill. Motor insurance will remain compulsory but will be extended to cover product liability for automated vehicles. When a motorist has handed control to their vehicle, they can be reassured that their insurance will be there if anything goes wrong. "The ABI’s Automated Driving Insurer Group has been engaged in constructive and productive discussions with the DfT for many months now so it is good to see the importance of insurance to the vehicles of the future recognised within this consultation. The development of automated driving will revolutionise motoring, potentially as important a road safety innovation as the seatbelt. Insurers strongly support the Government’s ambition of making the UK a world leader in this technology and believe the insurance industry has a key role in helping give consumers confidence in using these vehicles when they become more widely available." The driver’s insurer will still pay out in the normal way so road accident victims are promptly reimbursed – but the insurer will then be able to claim the money back from the car company if the vehicle is deemed to be at fault.